Learning to write starts a lot earlier than most parents think. Those scribbles, shapes and hard pressed pieces of artwork your child produces is the first stepping stone. Turning that artwork into letters can be tricky. These free printables encourage learning with colour. Try with W.
A child at this age will produce writing which first resembles scribbles drawn in a large circular motion. Children will commonly then continue to attempt their own name, shapes and some letters may begin to appear. Children of this age will use a palmer grasp (where the pencil is in the middle of the palm) as this feels the most stable for hands with weaker muscles. This is developmentally appropriate and is of no concern. It is crucial at this age that children have experiences learning to write on vertical and/or inclined surfaces. These experiences position the wrist correctly and allow children the chance to skillfully use their finger muscles rather than the muscles in their forearms. Check out this article to read more about handwriting milestones. Colouring in, doing dot-to-dots and mazes are all helpful learning games which allow children to explore the fun of handwriting while improving their skills. 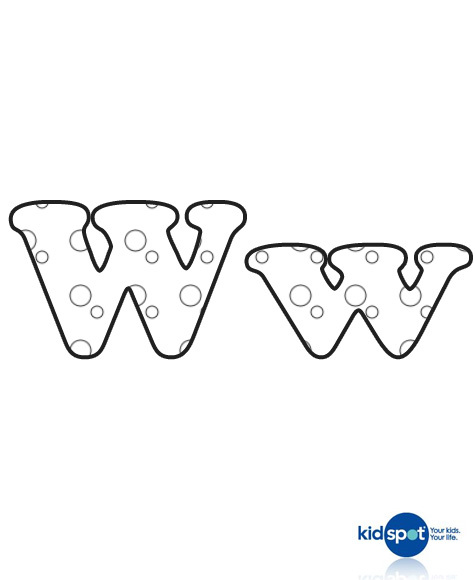 Click here to print the W colouring page.